Preparations and planning for an offensive against the PKK's Syrian affiliate in northern Syria on the east of the Euphrates River are complete, President Recep Tayyip Erdoğan said Tuesday, warning that a military operation against the terrorist group is imminent. "We will destroy the terrorist establishment on the east of the Euphrates. We have already completed our preparations, planning and program for it," Erdoğan said, referring to the PKK's offshoot the People's Protection Units (YPG), as he addressed ruling Justice and Development Party (AK Party) lawmakers in Parliament. The president said Turkey has already launched action against the terrorist group in the area east of the Euphrates River. On Sunday, the Turkish military hit YPG positions in the Zor Magar area to the west of northern Syria's Ayn al-Arab region, east of the Euphrates River, with artillery shells. The operation was conducted as a retaliation following YPG attacks on Free Syrian Army (FSA) factions in Marea town in northern Aleppo on Tuesday as well as other terrorist activities, including the construction of trenches and barricades. "Soon we will bring down the terrorist group with even more extensive and more effective operations," Erdoğan said. Turkey has long signaled an operation on YPG-held areas east of the Euphrates, as Ankara sees the presence of the U.S.-backed group as a threat to its national security. The YPG is organically linked to the PKK, which is listed as a terrorist group by the U.S., EU and Turkey. Yet, under the pretext of fighting against Daesh, the group has received immense military support from Washington, and has been acting as a U.S. proxy in the region, as pundits put it. Washington's support to the YPG, despite being an offshoot of the PKK, has also led to strained ties with Ankara. 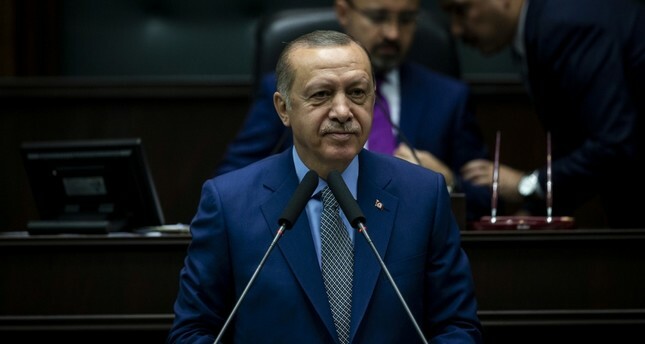 Erdoğan has previously criticized both former U.S. President Barack Obama's and President Donald Trump's administrations for providing thousands of truckloads of military support to the group at the expense of ties with Washington's historic NATO ally, Turkey. Erdoğan previously said that the U.S. has provided 19,000 truckloads of weaponry and military equipment to the YPG, which he said will ultimately be used against Turkey. "Aren't you strategic partners with us? We asked to purchase weapons from you and you rejected, but you give this terrorist group weapons for free. How do you explain this to the world? It is not possible to reach any goal with this imperialist mentality," the president had said in earlier in the month. The president has repeatedly said that a terrorist group [Daesh] cannot be eliminated by partnering with another one, referring to the U.S.' partnership with YPG terrorists. Erdoğan also said Tuesday that Turkey cannot "look to the future with confidence without solving the Syrian issue." Circles using terror groups as tools to reach their goals are trying to revive Daesh, Erdoğan said. "Neither people in the region nor the world believe in Daesh game." Turkey will never allow those who want to drag Syria into chaos by inciting the regime or reviving Daesh in the region, he added. Almost all the territory in the east of the Euphrates comprising some one-third of the territory of Syria, except for the Assad regime-controlled area near Deir el-Zour and the Daesh-held area near the Iraqi border, is controlled by the U.S.-backed Syrian Democratic Forces (SDF), which is dominated by the YPG. The SDF also controls the districts of Manbij and Tabqah on the right bank of the river. Due to its links with the PKK, Ankara has called the YPG-held areas a "terror corridor" and said repeatedly it will not allow the region to turn into an autonomous region administered by the terrorist group. Turkey considers the YPG's presence on its border with Syria, with Manbij in particular, a grave threat to its national security. Manbij lies northeast of Aleppo and just south of the Turkish border. Turkish troops and their allies the Free Syrian Army (FSA) have captured bordering Jarablus, al-Rai and al-Bab districts from the Daesh terrorist group through Operation Euphrates Shield launched in Aug. 2016. While Daesh terrorists were on retreat, the YPG also advanced to Manbij through a bridgehead and captured the town. The Turkish military and the FSA also cleared the Afrin district from the YPG in Operation Olive Branch launched in Jan. 2018. After Turkey and the U.S. agreed on a deal that focuses on the withdrawal of the YPG terrorist group from the city in order to stabilize the region and conduct joint patrols, the terror group has instead stepped up its presence and activities in the area. The terrorist group has completed the construction of trenches and embankments in areas surrounding the entire city center as if it has no intention of leaving.